Spring is shyly tiptoeing its way into our days as the sun rises earlier every morning and sets later with every evening. Most days are still not warm enough for me to take the boys out, but we’ve taken an evening stroll here and there. The ducks and geese have returned to the big pond in our backyard and make enough noise to outdo any rooster in the morning. I am not complaining though, I find it to be a nice reminder that nature is still around even in the midst of a busy suburban neighborhood. As I browsed the fresh produce section in search of ingredients for my husband’s upcoming birthday dinner, a few weeks back, the two and a half pound bag of fresh asparagus just couldn’t be passed up. I told myself I would find a creative way to cook up whatever we didn’t use, a nice little challenge for someone who’s never made anything other than steamed asparagus to go with our favorite steak dinner. 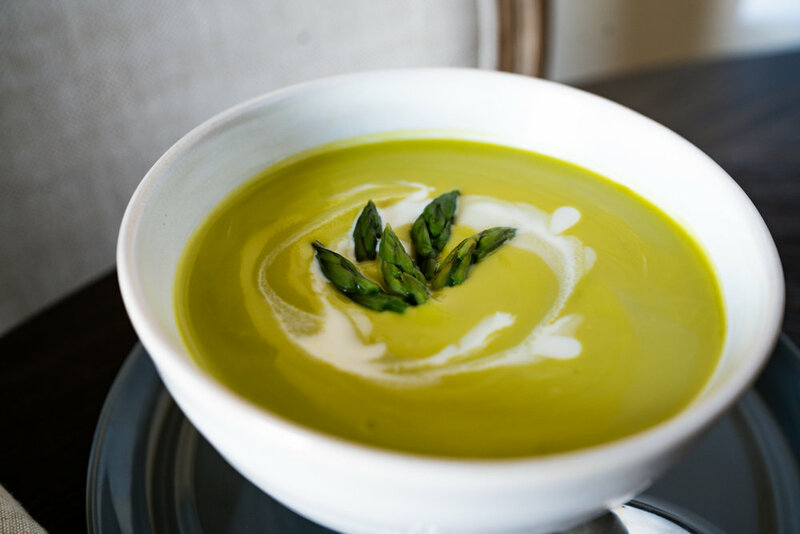 Having never made or eaten asparagus soup before now, this recipe has become a staple in my kitchen. Uncomplicated, light and flavorful, I like to pair it with stuffed eggs or open faced tuna sandwiches that include boiled eggs and spring onions. Heat a 2-3 quart saucepan over medium heat. Add the ghee and spring onions and sweat for 2-3 minutes. Cut the trimmed asparagus into 2 inch pieces and add into the saucepan along with the smashed garlic and salt. Stir well, cover and allow to sweat for 10-15 minutes. The asparagus should be tender and have released their juices. Reserve 10-12 asparagus tips for garnish if desired and transfer the remaining cooked asparagus mixture into a blender and blend on low until everything is more or less broken down. Add the chicken stock, lemon juice and cayenne pepper, increase the speed and blend on high until velvety smooth. Return the blended soup to your saucepan and heat on low flame. Stir in 3 tbsp of the heavy cream, reserving the remaining 1 tbsp for garnish. Taste and adjust the salt if necessary. 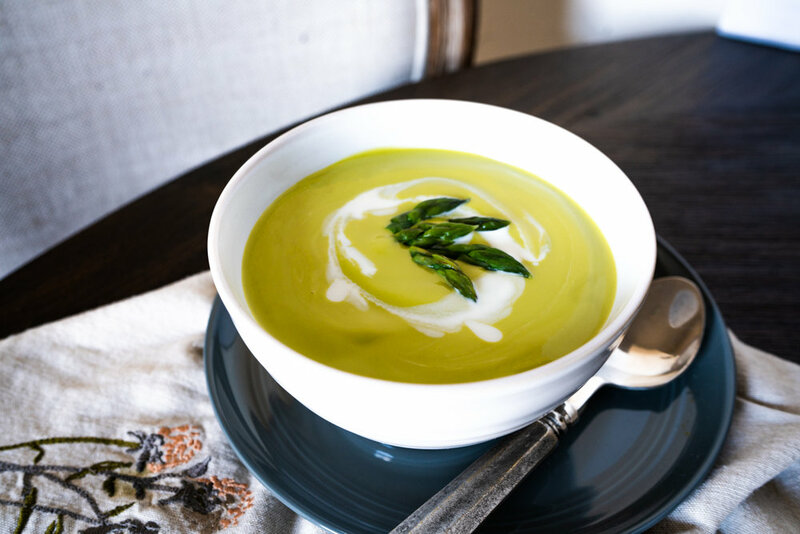 Serve the soup hot, drizzled with the reserved heavy cream and top with asparagus tips. Enjoy! As a child, I couldn’t wait until I was old enough to start cooking because, at the time, it seemed to be such a grown-up thing to do. It wasn’t too long before I found myself in charge of making dessert every weekend for our Sunday dinners, cooking up a pot of pasta or grains for weekday meals or cleaning vegetables for salads while my mother took care of the more complicated dishes. Over the years, as my skills evolved, I discovered the science in cooking with the help of ATK, made my way into the wonderful world of food blogging and collected cookbooks along the way. Yet none of this guarantees my being a good cook, “good cook” being a relative term here. I’ve known someone who finished culinary school and went on to work in an office. Then there is this guy, who made a name for himself in the professional world of cooking right out of his home kitchen. Do not discredit yourself because you’ve never tasted it or have never made it before, with enough time and experience (practice, practice, practice! ), you can pick up any recipe and know when you’ve nailed it or not. Enter English scones recipe below. Even though I grew up with my own cultural version of tea time, I think English afternoon tea holds a fascination with many young ladies including myself. The porcelain tea sets, the beautiful tiers of dainty finger foods and the ubiquitous scones - I had to try them! Armed with The Book of Afternoon Tea, my first batch of scones was not very promising; dense, bland, and dry, they had me second guessing whether I wanted to pursue the recipe. I continued to nibble on them throughout the evening and eventually began to see the potential. A bit of background work later, I found that online reviews of various scone recipes were invaluable in revealing what made a good scone, so I got to work. Cream replaced milk, all-purpose flour (with a proper amount of baking powder) took place of the traditional self-rising flour. An egg and a splash of vanilla worked to enhance the texture and flavor. As for the clotted cream, it is a delicious cross between butter and whipping cream. Tasting of “baked milk” and a bit of nuttiness, the cream takes on a slight caramel flavor with the development of a golden brown crust when cooked uncovered. After more than one evening of sampling scones, I have no doubt these are as good as the ones served overseas. 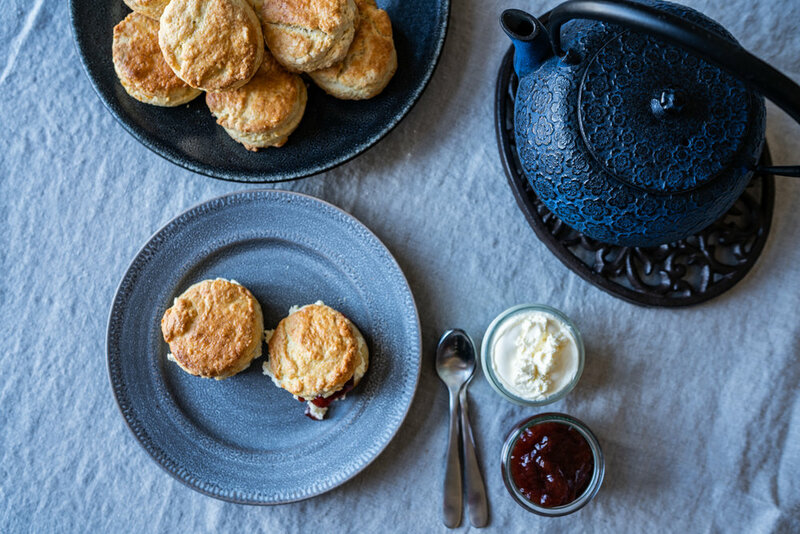 Start your clotted cream tonight and enjoy a batch of scones with your favorite cup of tea tomorrow. For the clotted cream: heat your oven to 180º F. Pour the heavy whipping cream into a shallow baking dish, cover with a lid and place into the oven. Bake for 12 hours, cool to room temperature, cover with plastic wrap and chill in the refrigerator overnight to allow the clotted cream to set. Use a slotted spoon to scoop out the thickened cream while leaving the residual liquid (whey) behind. Your clotted cream will simply be a bit runnier if any of the residual liquid is combined with the cream you scoop out. 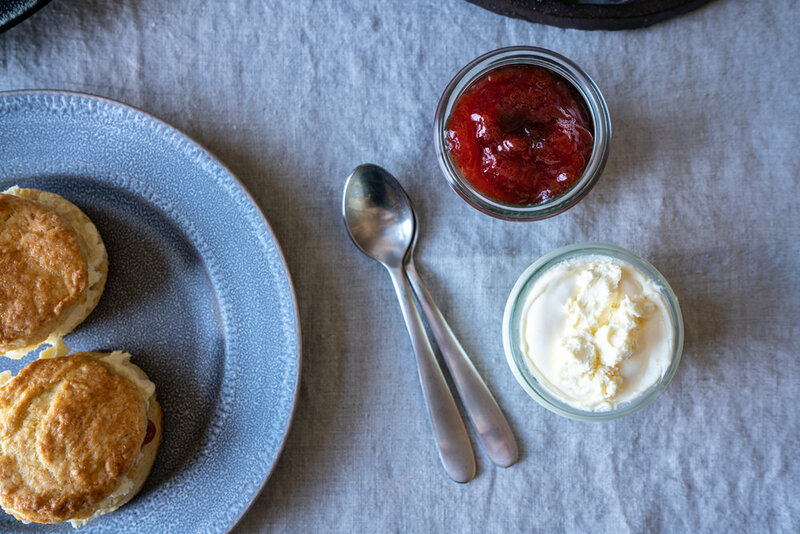 Place the clotted cream into a container with a tight fitting lid. It will keep in the refrigerator for 2-3 weeks. The residual liquid can be used in place of milk in other baking (such as in the scones recipe below). For the scones: beat 1 large egg until homogenous. Measure out 1 Tbsp of the beaten egg and combine with 1 tsp of water in a separate cup. Combine the remaining beaten egg (about 4 Tbsp) with the heavy cream and vanilla extract. Set aside. Heat your oven to 425º F and flour your baking sheet (or line it with parchment). In a large mixing bowl, whisk together the flour, salt, and baking powder. Add the butter to the flour and toss to coat. Using a pastry cutter and/or your hands, cut the butter into the flour until the flour mixture resembles soft sand. Stir in the sugar and dried currants (if using). Make a well in the middle of the flour mixture and add the heavy cream/egg mixture into it. Using a spatula, stir the the liquid gently, incorporating the flour, going around the bowl until there are no dry ingredients left and a clumpy dough has formed. Transfer the loose dough onto your work surface and gently gather and press the dough together until it forms into a cohesive ball. Roll the dough out into a 1/4” thick and using a cookie or biscuit cutter about 2” in diameter, punch out as many scones as will fit. 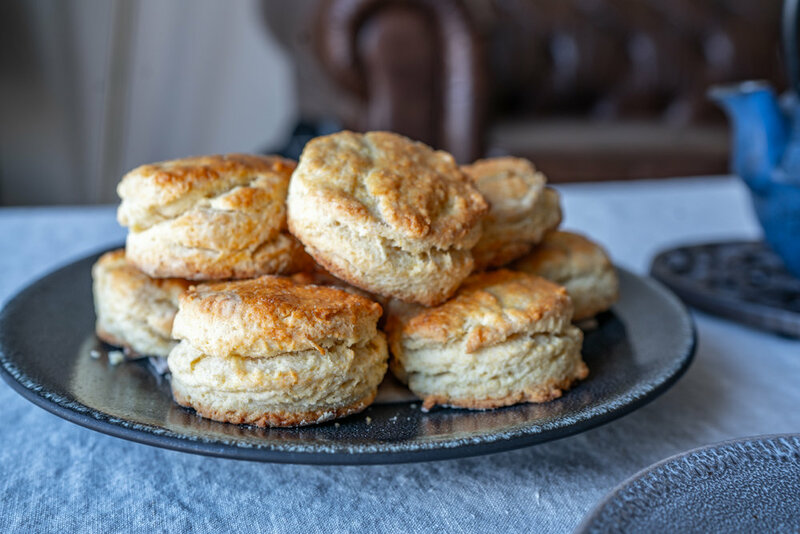 Transfer the cut scones onto your prepared baking sheet and brush the tops with the egg wash.
Gently push together the leftover pieces of dough, roll out 1/4” thick and cut out more scones. Repeat this as many times as necessary in order to use up the remaining dough. These scones might not rise as well as the first ones but they will be just as delicious. Bake scones for 10-12 minutes until the tops are golden brown. Once baked, you can cool them on a wire rack for a few minutes or directly on the serving tray. 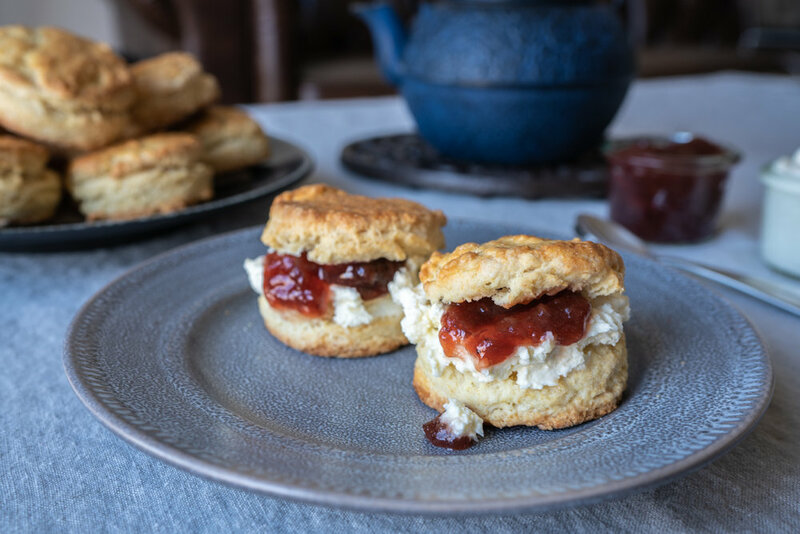 Serve with clotted cream, your choice of jams or preserves and hot tea. It’s writer’s block, I am quite convinced of it. I’ve had this recipe ready to go for a few weeks now, I’ve bragged it up and down to both sides of the family and yet it’s still stuck in my drafts folder. Tonight, that is all about to change. I love chickpeas and I love hummus. 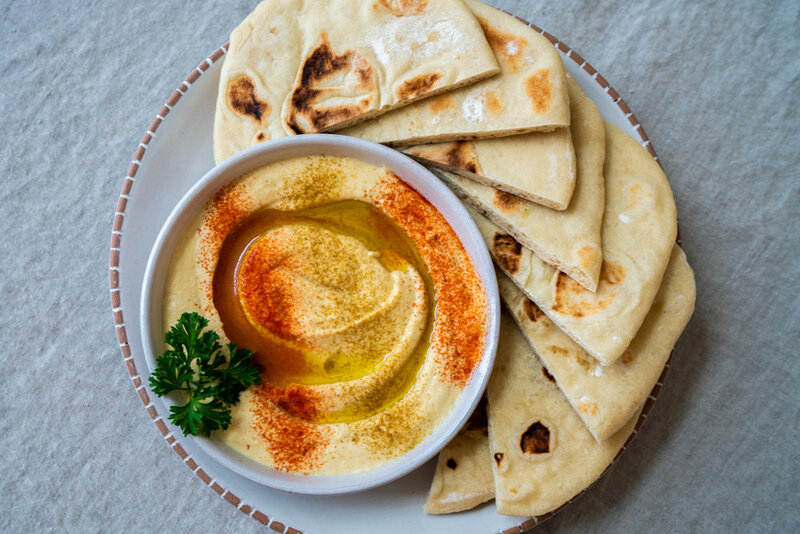 Over the years, I’ve noticed that the best hummus I’ve eaten was always at a restaurant and I could never come close to replicating it at home. It was never light or creamy, but instead thick, grainy and tasting too heavily of tahini. That is, until now. I happened to be browsing through Pinch of Yum and came across their basic version of hummus. Upon a closer look, I noticed that the recipe called for peeling chickpeas and starting with a tablespoon of tahini. I could hardly believe it! It was like somebody had finally given me permission to do what I always knew should be done. I have made hummus numerous times over the years and with every attempt I told myself it would be less tahini the next time. But every “next time” brought a new recipe to my attention and there I went again, following it to a “T” with the same verdict - less tahini! I feel like I was the only one with this dilemma. No matter. As I continued to read and compare, the ratio of chickpeas to tahini seemed to be the same everywhere. I kept thinking to myself “how’s it possible that all the recipe developers write one thing (heavy on the tahini) and restaurants serve another (balanced and light-tasting)?” Not anymore. Oh, and peeling the chickpeas? It seems to me I’ve fallen behind in keeping up on the latest cooking trends while most professional cooking sites omit the step completely for fear of overwhelming their readers. Pick your battle. Seriously, the reduced tahini was a game changer and since I was on a roll, I took it to the next level and added yogurt. This is not actually my own idea (thank you Maureen Abood!) but something told me that I would like it. 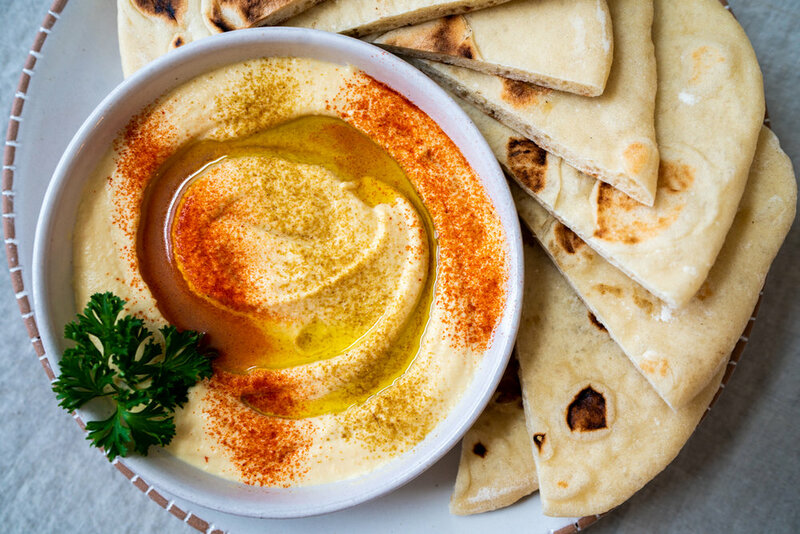 The yogurt adds an airiness and softness to the hummus that I absolutely love. With a cheesy grin, I also realized that this must be the secret behind our favorite hummus at a local restaurant in MO. A heavily accented “sorry, restaurant secret.” was all I got from him when I called to inquire about the recipe. It’s a very good secret, sir. You have my respect. For canned chickpeas, check here and here for tips on removing the skins. After soaking the chickpeas overnight, cooking times can vary greatly. I’ve cooked them for as little as 45 minutes and as long as 4 hours. Keep checking the chickpeas for doneness by simply tasting. A properly cooked chickpea should remind you of a mashed baked potato in texture. If you taste graininess, continue cooking until that is no longer the case. If you have a a powerful blender such as a Vitamix, skip removing the skins and blend the chickpeas on high for 1-2 minutes. Be warned that you will need to scrape down the blender often to make sure all of the ingredients are incorporated. Also, you will likely need to use more of the reserved cooking liquid to help the blending process. Do a quick soak in just an hour if you forget or prefer not to soak the chickpeas overnight. Simply bring the chickpeas to a boil in a pot of water, turn off the heat and allow to soak for an hour or longer before proceeding to step 1. 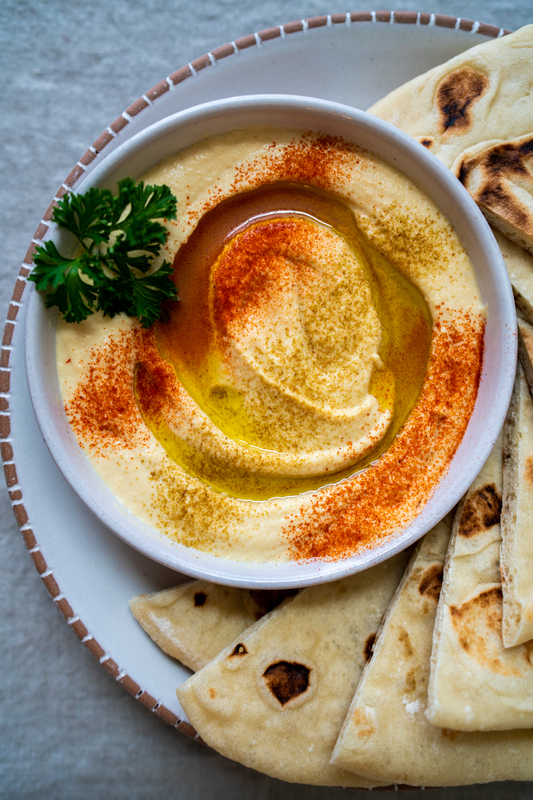 After everything is said and done, you will have a delicious bowl of hummus that is at room temperature or cooler. If you would like to serve it warm, bring the reserved cooking liquid to a simmer before adding it to the chickpeas in the food processor. Rinse the soaked chickpeas and place them into a large heavy-bottomed saucepan and cover with 2 quarts of cold water. Add the baking soda and bring to a boil. Reduce to a simmer, cover and cook for 45-60 minutes until chickpeas are very tender and skins have loosened. Reserve 1 cup of the cooking liquid and drain off the rest using a strainer. Cover the cooked chickpeas with cold water to cool them off and make removing the skins easier. Grasp each chickpea between your first three fingers and pinch slightly, allowing the chickpea to slip out the skin and fall into a clean bowl. Place the cleaned chickpeas into the bowl of a food processor along with the salt and clove of garlic. Process for 1 minute, scrape down and continue processing for an additional 30 seconds. The mixture should resemble mashed potatoes. If the mixture is crumbly and dry, your chickpeas are undercooked. Continue processing the chickpeas until they resemble mashed potatoes. If after 5 minutes of processing that is not the case, you will need to start over with a new batch of chickpeas. Add 1-2 Tbsp of the reserved cooking liquid to loosen the chickpea mixture. Add the lemon juice and process for another 30 seconds. Now add the tahini, 1 Tbsp at a time, tasting in between each addition until it is to your liking. In my opinion, it only takes 1 Tbsp too many for the tahini to start taking over the show. Add the yogurt and continue processing for 1-2 minutes until the mixture is smooth. Now add about 1/4 cup of the reserved cooking liquid in a slow drizzle. Check the consistency of the hummus by scooping it up with a spoon and continue adding more liquid until the hummus starts to look whipped and feels/tastes soft and airy. Transfer the “whipped” hummus into a shallow bowl and give it a quick swirl using a spoon. 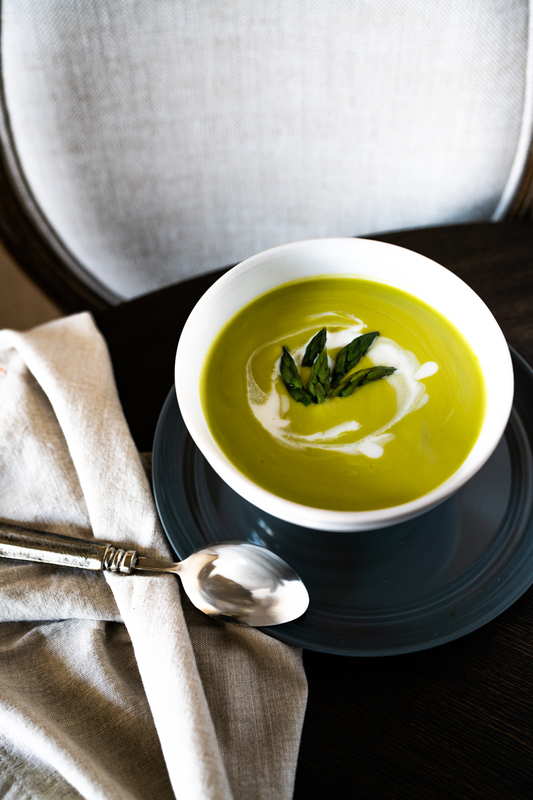 Drizzle with olive oil, sprinkle on some paprika and cumin, and give a generous sprinkle of parsley and/or mint for a pop of color and herbal freshness. Serve with pita/naan bread and freshly sliced veggies for a fantastic appetizer or snack. Happy new year to all of my readers! I hope you had a wonderful time celebrating (or peaceful slumbers) and are as excited for 2019 as I am. The old year has gone, washed away with yesterday’s rain, but it cannot be forgotten for it had brought so many beautiful changes to our lives. We welcomed the birth of our second son, Maximus, in October, my husband started a new job in northern Indiana, where we now reside, we witnessed the marriages of three siblings just within the last six months, and oh so many other blessings, the list could go on for awhile! 2018 was a memorable year and I am already confident that 2019 won’t be left in the dust. Like the “old year”, cooking trends come and go and yet there is something to be said about old-school, traditional, recipes that call for breaking a bit of sweat over the stove. With every new year, the collection of fast, easy, fool-proof and “under-30-minutes” recipes grows by the hundreds while the recipes that started it all seem to fade away. 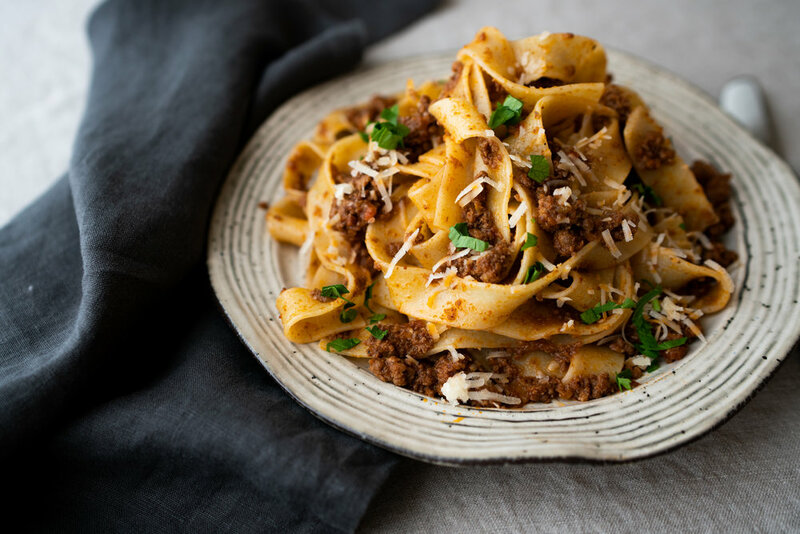 This bolognese has no such claims and fits right into the old-school and traditional category. 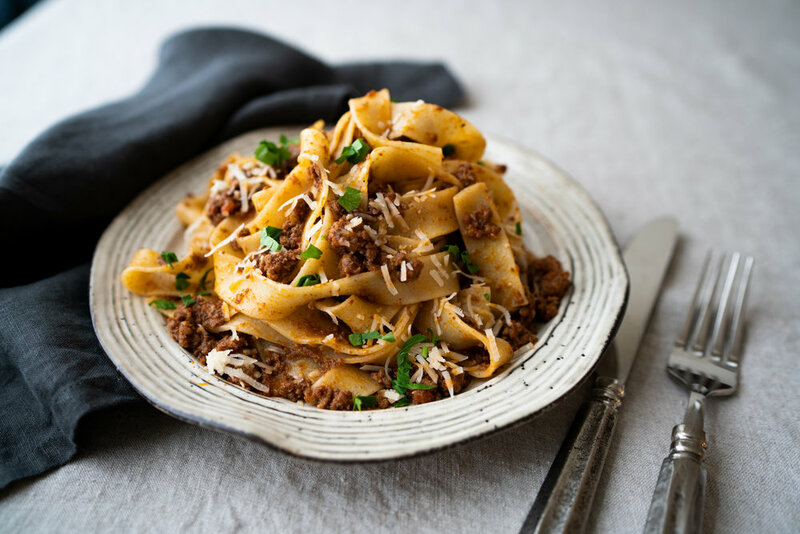 It is a dish full of coziness that finds you plunking down at the kitchen table, embracing a bowlful of pasta goodness and eating to your heart’s content all the while gazing out your window at a winter wonderland. Such musings have me craving a bowlful myself as minus the winter wonderland since we have yet to get any snow in our area. This particular recipe I adapted from Lidia’s Mastering The Art of Italian Cuisine. 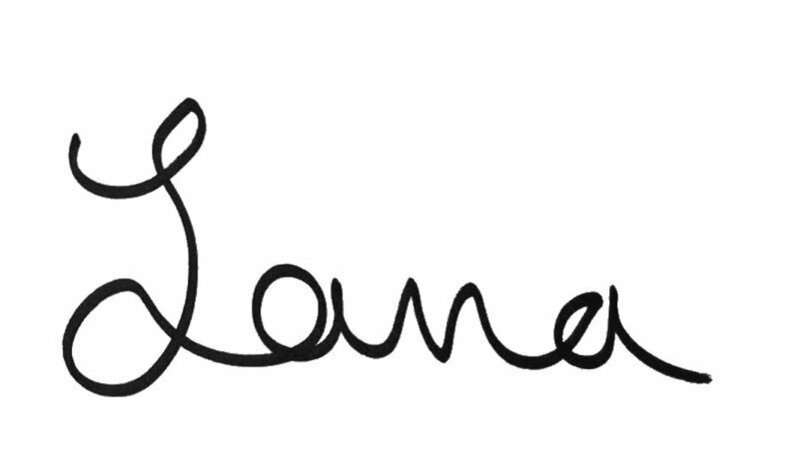 It is a wonderful resource and I highly recommend it be added to your collection of cookbooks. While you are out shopping for ingredients, check your grocer’s pasta aisle for Italian bronze-cut pasta. Though a bit more expensive than most pastas you’ll find on the neighboring shelves, it is worth the splurge. 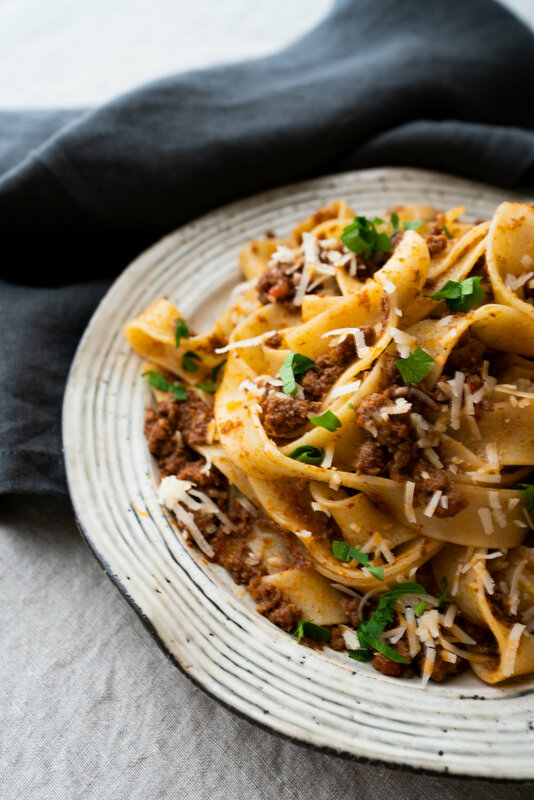 The difference lies in the fact that the pasta is cut using a bronze die, which gives it a coarser texture and makes it superior in dishes such as bolognese. Mass produced pastas, on the other hand, are produced to look and feel shiny using teflon dies and thus loose their ability to give sauces a grip on their surfaces. The eating experience is also different, with a chewy texture and a wholesome mouthfeel that I love so much in pasta. Give it a try and let me know what you think! In a mixing bowl, combine the ground beef and pork along with 1 cup of the dry wine. Mix well until all the liquid has been incorporated into the meat. Set aside. Using a food processor, combine the prosciutto and garlic and grind into a dry paste. Transfer into a separate bowl and set aside. Add the roughly chopped onion, celery stalk, and carrot to the food processor. Process for 15-20 seconds until the vegetable are finely minced, not pureed. Set aside. Heat a dutch oven (4 to 7 quarts in size) over medium heat for at least 5 minutes and then add the olive oil and butter. Once hot, add the garlic and prosciutto and cook for 3 minutes. Add the minced vegetables to the pot and cook, over medium-high heat, until softened, about 5-7 minutes. Add the beef and pork mixture along with 2 tsp of kosher salt. Cook until all the liquid has evaporated, stirring often. This will take 30-45 minutes, depending on how big your pot is. In a separate saucepan, heat the chicken broth and cover with a lid. Keep warm over a low flame. Add the remaining cup of dry wine to the meat mixture and cook until almost completely evaporated, 5-10 minutes. Move the meat and vegetables aside in the pot to create an empty space to which you will add the tomato paste. Allow it to toast for about a minute before incorporating it into the meat. Stir in the crushed tomatoes. Once again, continue cooking until most of the liquid has evaporated. Now that all of your ingredients (except for the chicken broth) have been added to the pot and most of the liquid boiled off, using a label, add enough of the hot chicken broth to cover all of the meat in the pot. Cover and adjust the heat to maintain slow, steady cooking with small bubbles breaking the surface. Cook the mixture for 3 hours, checking and stirring the pot every 30 minutes. The liquid levels should and will be reducing throughout the 3 hours and you will need to add more hot broth as needed to keep the meat submerged. Toward the end of the 3 hours, you should have a highly developed sauce with the meat seemingly suspended in it. 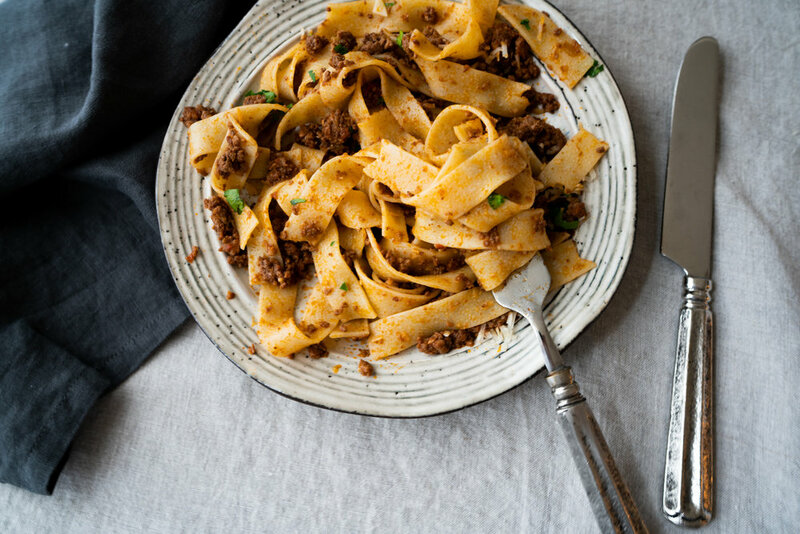 If you simply have too much liquid then continue to cook the meat sauce uncovered until it reduces to the consistency described earlier. Once finished cooking, you can skim off any excess fat if you feel the need and top it off with freshly ground black pepper. Serve over your choice of pasta with the suggested cheese and fresh parsley. Any leftover sauce can be store in the refrigerator for up to a week or frozen for up to 6 months. 10 oz canned San Marzano tomatoes and juices, crushed. 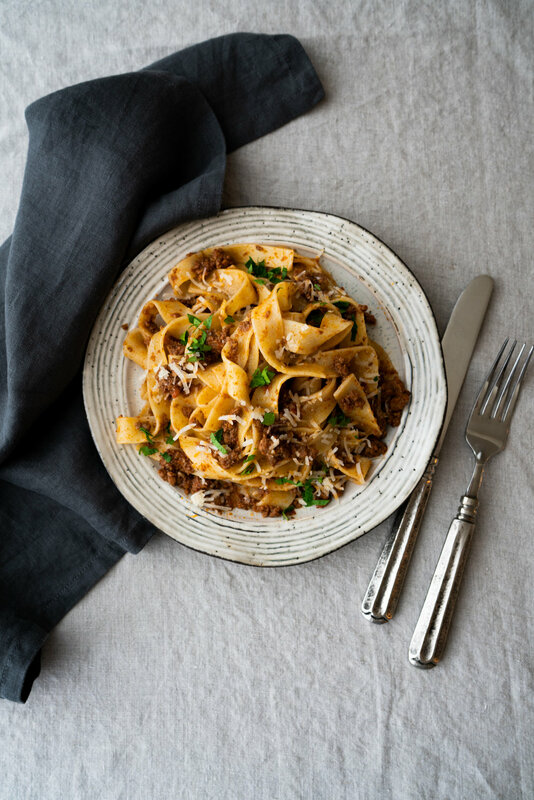 wide pasta such as pappardelle or tagliatelle, cooked to al dente.